This morning, the Census Bureau posted the Advance Report on the latest Durable Goods New Orders. This series dates from 1992 and is not adjusted for either population growth or inflation. 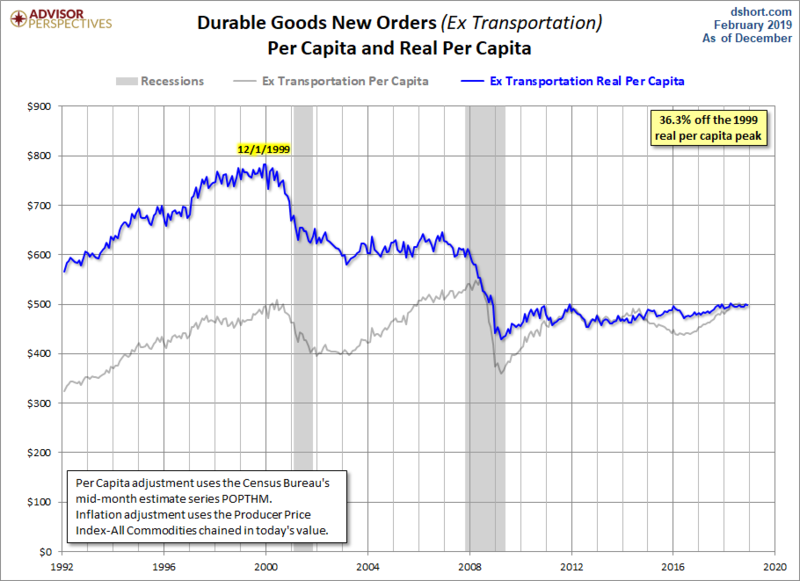 Let's now review Durable Goods data with two adjustments. In the charts below the gray line shows the goods orders divided by the Census Bureau's monthly population data, giving us durable goods orders per capita. The blue line goes a step further and adjusts for inflation based on the Producer Price Index for All Commodities, chained in today's dollar value. 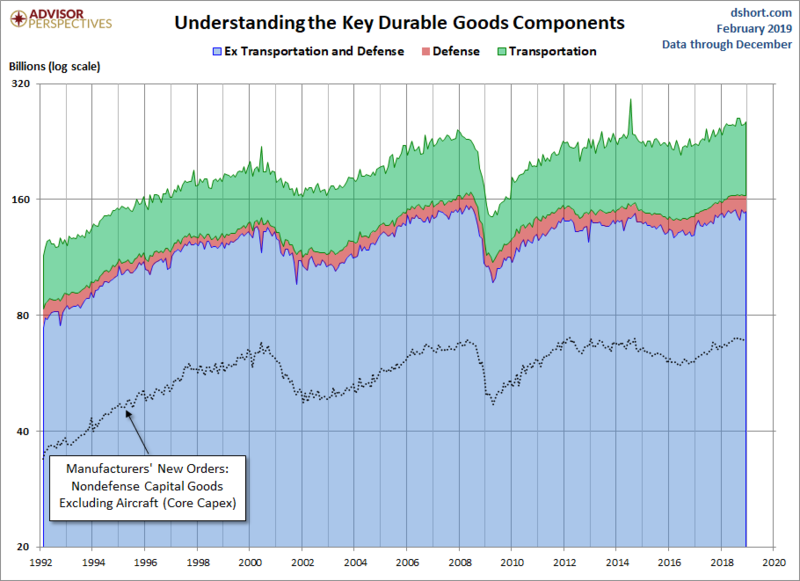 This gives us the "real" durable goods orders per capita and thus a more accurate historical context in which to evaluate the conventional reports on the nominal monthly data. We've included a callout in the upper right corner to document the decline of the latest month from the all-time peak for the series. Economists frequently study this indicator excluding Transportation or Defense or both. Just how big are these two subcomponents? Here is a stacked area chart to illustrate the relative sizes over time based on the nominal data. We've also included a dotted line to show the relative size of the Core Capex subset, which we'll illustrate in more detail below. 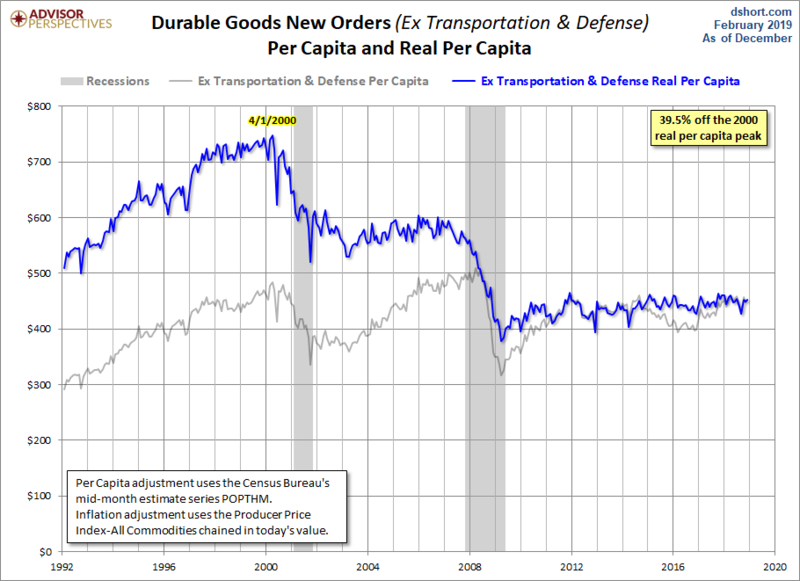 Now we'll exclude both Transportation and Defense for a better look at a more concentrated "core" durable goods orders. 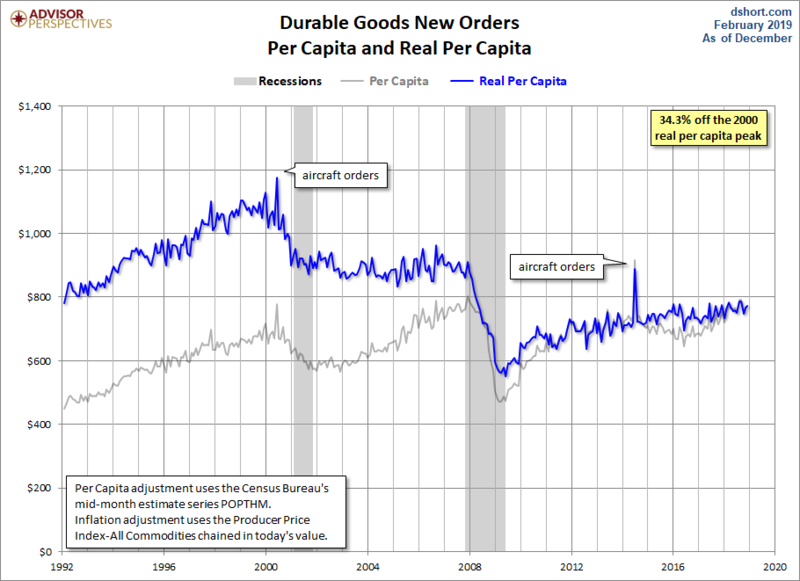 Here is the chart that gives the most accurate view of what Consumer Durable Goods Orders is telling us about the long-term economic trend. The six-month moving average of the real (inflation-adjusted) core series (ex-transportation and defense) per capita helps us filter out the noise of volatility to see the big picture.